The increasingly thoughtful and mindful consumer will continue to catalyze changes in the way that companies produce, package and label their products. More conscious than ever about making responsible food choices, 4 in 10 US and UK consumers increased their consumption of "healthy foods," 7 in 10 want to know and understand the ingredient list, 1 in 5 in the US are most influenced by "real" ingredients, and ethical claims on packaging are top of mind. In response, better-for-you claims continue to be on-trend, having increased their market penetration from 42% in 2012 to 49% in 2017 YTD. "Today's consumer displays a high level of mindfulness about well-being and the environment," reports Lu Ann Williams, Director of Innovation at Innova Market Insights. 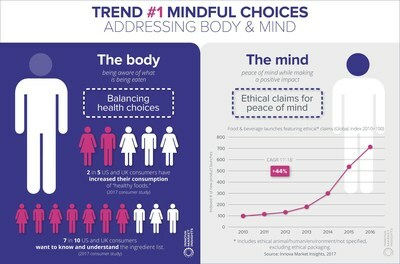 "So it is no surprise that consumers are becoming increasingly mindful in their food choices, wanting to know what is in their foods in order to make decisions about health, sustainability and ethical issues." 1. Mindful Choices. Consumers are more conscious than ever about making responsible food choices, and increasingly want to know what is in their food and how it is produced. Innova Market Insights research data indicates that 1 in 2 US, UK and German consumers read ingredient labels often and that 7 out of 10 US and UK consumers want to know and understand ingredient lists. At the same time, rising levels of interest in ethical issues have resulted in the use of ethical claims for food and drink NPD soaring in recent years, with a CAGR of 44% over the 2011-2016 period. 2. Lighter Enjoyment. As consumers continue to look for ways to eat and drink more healthily, lightness in terms of alcohol content, sweetness, flavor, texture or even portion size is increasing its appeal, although definitely not at the expense of a familiar, high quality and indulgent taste profile. 5. Beyond the Coffeehouse. While coffee is clearly trending among Millennial and Generation Z consumers, tea is also seeking to reinvent itself among the younger generations. With the taste and experiential associations of coffee and the healthy image of tea, the industry is increasingly using coffee and tea as ingredients and flavors outside the hot drinks and iced tea and coffee sub-categories across a wide variety of products as varied as energy bars, yogurt and jam. The Top Trends for 2018 will be presented by Innova Market Insights at a live webinar to be held on November 21, 2017 at 4pm CET/10am EST. Register here! The Innova Database (http://www.innovadatabase.com) is the product of choice for the whole product development team. See what food manufacturers are doing around the world in a way you never thought possible. Track trends, competitors, ingredients and flavors. It contains excellent product pictures, search possibilities and analysis. Get the world of new products on your desk, set e-alerts, examine category activity, find new ideas, be inspired. In today's fast moving environment this is a resource you cannot afford to be without.